It’s official…I’m in the holiday spirit! Who else is ready to enjoy the plentiful parties, presents and good cheer? As we approach the most wonderful time of the year, I’ve got gift giving on my mind. There are so many fun gift guides out there, but sifting through them can take longer than checking off the nice and naughty lists. So, this year I thought I’d share some ideas straight out of “Closet Design Bible” (which, by the way, makes a stellar stocking stuffer!). The coffee table book is chock full of gift ideas -- from everyday essentials to pretty, decorative pieces -- for your family and friends that won’t break the bank. 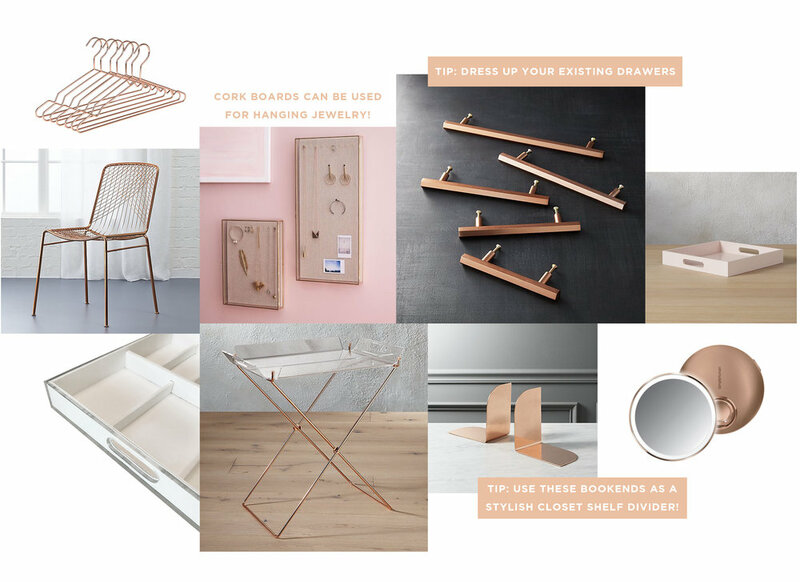 I’ve curated a few of my favorite pieces from CB2, WestElm, and the like to implement my ‘Tips’, and divided them into four categories — Not so Basic Black, Brass and White Marble for the Masses, Coming Up Rose (Gold) and Shades of Silver and Gray. There’s sure to be a selection to complement any look! Happy gifting! We all have that person in our life who believes black is superior to every other color. Fortunately, you don’t have to default to a basic black present. How about this marble tray that can serve as a display for flowers and candles or even a holder for jewelry? The tray is also a chic catchall for your man’s keys and coins. Check out chapter 17 -- “The Man Cave Closet” -- for more guy gift inspiration. A couple easy closet upgrades that are often overlooked are switching out dresser handles and enhancing a blank wall. These marble handles can easily elevate dresser drawers while this notched marble wall hook can be used to stage outfits on an empty wall. Need an unexpected stocking stuffer? LA Closet Design’s purse pillows are perfect for your handbag-hoarding friends. Marble and brass used to be the ultimate luxury materials. Today, they are more accessible, meaning there’s plenty to pick from beyond countertops and bathroom fixtures (those aren’t exactly presents that can be wrapped and tied with a perfect bow anyway). A trash can is certainly not a conventional gift, but this glam brass wastecan gives trash a truly luxe look. This clever clothing rack made from industrial pipes is a stylish space-saver and great for showing off special wardrobe pieces. We all know the gal with a lot of fashion goodies, and these glass and brass linen-lined shadow boxes hold keepsakes and accessories while adding style to shelves, dressers and vanities. We created similar built-in glass displays in Khloe Kardashian’s workout closet for her athletic accessories (flip to chapter 16 -- The West Coast Workout Closet” -- for a closer look). 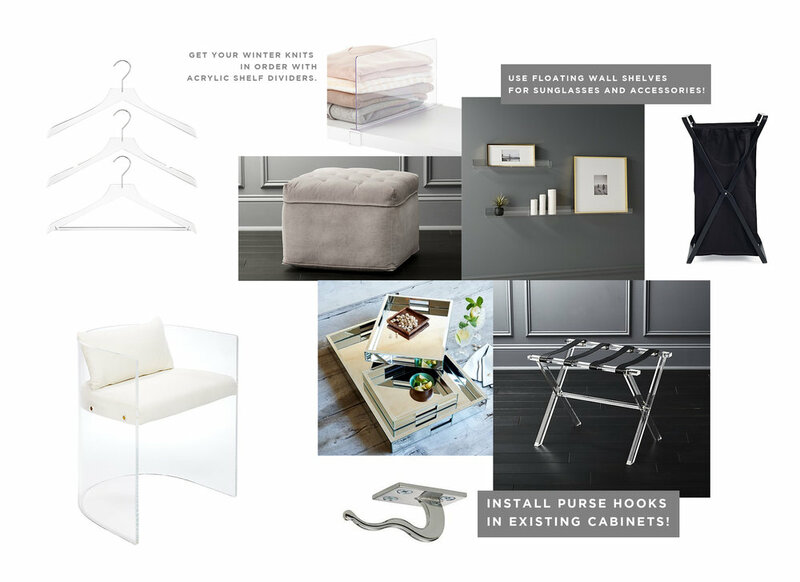 It’s no secret I’m obsessed with gray and anything that falls into the mirrored and acrylic categories. If you’re searching for a gift for a fellow gray fanatic, look no further. For starters, this velvet tufted pouf can work as a seating area in a closet or another room in the home. Know someone who has frequent out of town guests? This acrylic luggage rack with leather straps is as fashionable as it is functional! I also adore these acrylic wall shelves that can be suspended in a closet or elsewhere and used for everything from holding beauty products to displaying art to showcasing succulents. Need a unique, yet practical stocking stuffer? LA Closet Design’s purse hook works on the closet wall or underneath a shelf to keep handbags from hitting the floor. Chapter six -- “The French Manor Closet” -- shows how to hang multiple purses in the same space. They work for scarves, too!